Paddy and Plunkett are back! 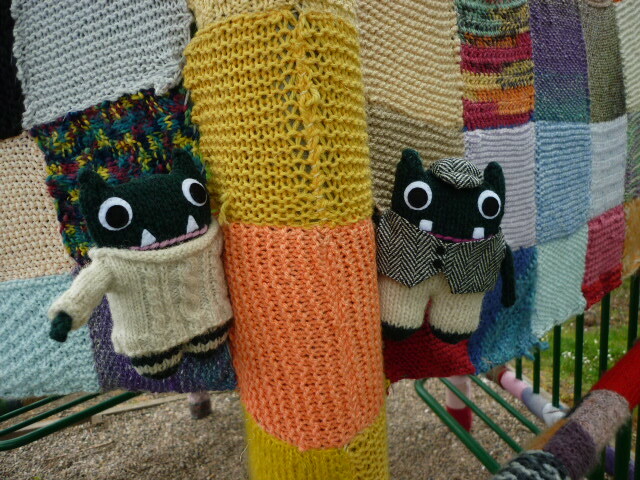 Or, more correctly, they’ve gone on holiday again and sent me more tales of their adventures to use on the BeastieBlog. This time, they’re exploring the delights of Scotland! Their journey begins in Glasgow, which is almost a homecoming for them – I’m a quarter Glaswegian myself, so there should be a teeny bit of Scottishness knitted into the genetic material of these otherwise Irish little monsters! …What is it with Beasties and graveyards at the minute?! They also visited the Transport Museum – Paddy has a bit of a thing for classic cars. I think he’s going to have to find someone a little taller than him to help with the driving, though. Meanwhile, architecture buff Plunkett had stumbled on this incredible staircase at the Central Hotel, in the railway station! Since they were in the station anyway, the two of them decided to hop on a train and head to Aberdeen on the north east coast… And look what they found when they arrived! How nice of the locals to knit up a cosy Beastie hotel for them to stay in! Paddy and Plunkett are a special sub-species of Beastie called “Barróg Beasties”. “Barróg” is the Irish word for “hug”, which neatly sums up how friendly these little monsters are! They’re also special because they’re made from 100% Irish wool, which is spun and dyed in a family-owned mill in Co. Kilkenny. Super-observant regular readers may also notice that further changes have been afoot on the BeastieBlog – after nearly two years with the same look, I was encouraged by Blogging 101 to consider overhauling my theme. I’d love to know what you think of our makeover… let me know in the comments! Next Post A Lazy Summer Afternoon with Pint Beastie! I can’t wait to see what adventures your Beasties get up to next, on a serious note they have a better lifestyle than me !!! !